Harikrishnan V Nair won the huge amount yesterday in 'Big Ticket' raffle draw. Harikrishnan V Nair works as a business development manager for a firm in Dubai. 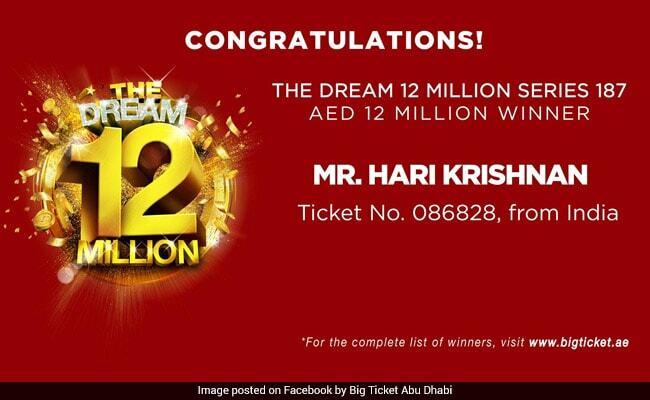 Dubai: An Indian man in the UAE has hit a jackpot by winning a whopping dhirham 12 million (USD 3.2 million) in the biggest-ever raffle prize money in Abu Dhabi. Harikrishnan V Nair, 42, who works as a business development manager for a firm in Dubai and has been living in the UAE with his family since 2002, won the huge amount yesterday in 'Big Ticket' raffle draw. "I still cannot believe it. Is it me? Is it really me?" an excited Nair, who is from Kerala, told Khaleej Times. He said he had bought the tickets twice before, but had never won. Nair said he had always wanted to travel the world with his family and the time for it has come. "I think 2018 is the year for that. I will plan a world tour soon," said Nair, father of a seven-year old son. "I would like to plan for my son's education and buy another house in India. I want to take good care of my mother and my wife's mother too, who are in India," he said. Charity is also on top of Nair's agenda. "I have always wanted to help people in need, and by God's grace I can do it now. That is something I will really do," he said. His wife, a logistics support staff, said she could not believe the news. "I was dump-founded when I got the call from my husband. First I thought he was playing the same prank I had planned on him," she said. "Now that he has won the jackpot, I will let him figure out what he wants to do with it. He is after all a business development manager and would know better how to manage his funds," she said. Eight Indians were among 10 people who had won dhirham 1 million (USD 2.7 lakh) each in a mega raffle draw in Abu Dhabi in October last year. In August, an Indian man had won dhirham 5 million (USD 1.3 million) in the draw in the UAE.